Taskmod is simple & easy to use task management software. 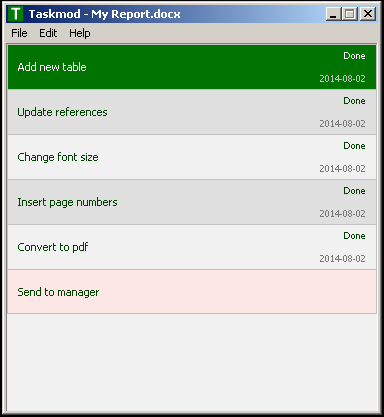 It allows you to define tasks for files & folders. Unlike other standard to-do list managers, Taskmod puts small icon beneath your file to indicate progress of your tasks. This unique feature allows you to get idea about each file progress by just looking at them. You are currently browsing the Tools & Technologies From Hasaranga blog archives for September, 2014.